The Astera AX1 Pixeltube is an IP65 waterproof, pixel controllable, decorative LED RGBW baton that can be mounted or used anywhere. While it is designed primarily for event use, the AX1 could be used by filmmakers as either a substitute for practical light sources, or for special effects. The lights work with a specially optimized RGB color space: AsteraRGB. This system eliminates the need to control each colour individually. 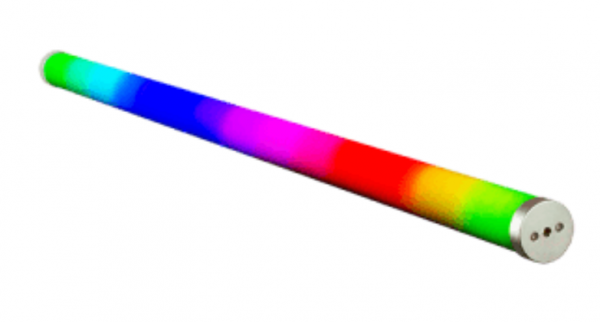 Instead, the light calculates the optimum combination of all colours based on an RGB value. It considers each LED chip’s temperature as well as an optimal colour rendering. 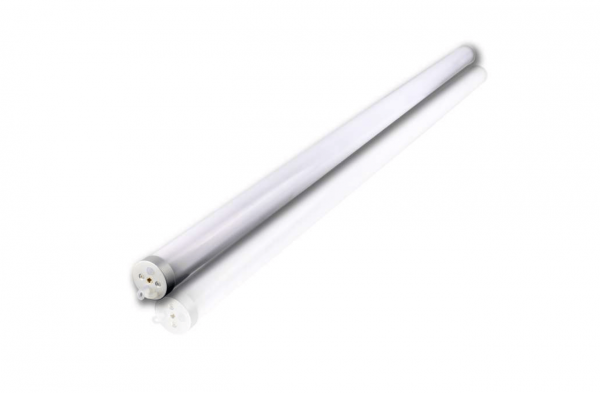 The Astera AX1 Pixeltube is an RGBW LED tube light that only draws 28W of power. This enables the light to be run continually for up to 20 hours via its in-built Samsung lithium-ion battery. Once exhausted, the battery takes seven hours to charge – and if that leaves you in a spot the AX1 can also be powered by mains electricity. The light generates a 180° beam angle, but only puts out 696lx. The lights are constructed out of polycarbonate, and feature metal end caps. They weigh in at 1kg (2.2Lbs) and are 103.5cm (40.7″) long with a 4.2cm (1.6″) circumference. The AX1 Pixeltube offers several mounting options. For a quick vertical setup an included stand can be screwed via its M5 thread onto the tube. For hanging the tube there are hangers that can be fixed with screws to wooden surfaces or fixed to truss via a 1/4” Manfrotto stud and a Manfrotto clamp. The lights can be controlled via the AsteraApp, an IR remote control or through Wireless DMX (2.4GHz). The light also has a built in standalone engine. It can display static colors or replay a number of predefined effect patterns with a customizable colour palette. By using the AsteraApp these effects can be created and be sent to the light by the integrated UHF receiver. The effects are triggered and then each light replays it autonomously until it receives a new effect. Lights can be controlled individually but they can also be grouped into sets, and effects can be used over up to 32 lights. The company claims that the light is flicker-free, and the refresh rate of this light is 599.4 Hz by default. This frequency can be freely adjusted between 200 Hz and 1205 Hz to fit different frame rates from different cameras. 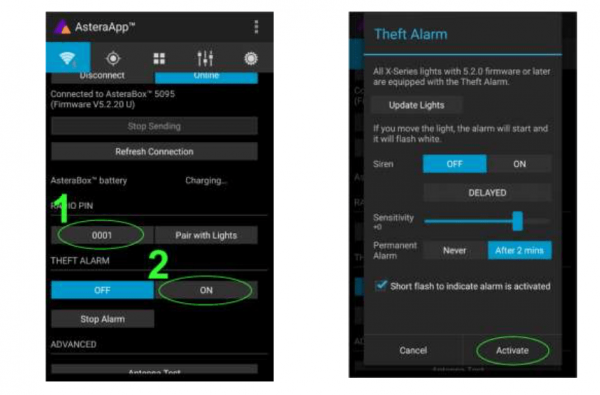 Another nice addition is a built-in anti-theft system, so the lights will give you a visual and audible alarm and send notification to the AsteraApp if they are being moved while they are on and working. For music videos there is a DJ feature where an auto BPM function analyzes the beat and matches programs to it. Flash buttons can also trigger special effects while being held down. 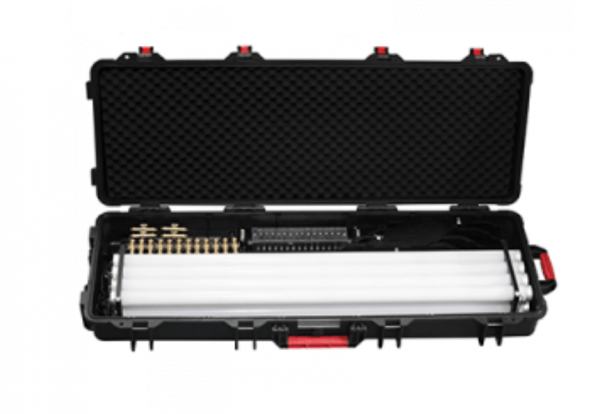 The AX1 comes with a charger, two eyebolt holders, two clamp holders and a stand for positioning the light vertically. There is also an optional charging and carrying case that lets you transport and charge eight units at once. The Astera AX1 Pixeltubes retail for around €390, which is considerably cheaper than the similar Digital Sputnik Voyager, although the Digital Sputnik Voyager does have 64 individual pixels as opposed to only 16 for the AX1.